Thank you to everyone who came to our Birthday Party at the weekend, what a huge success! It was lovely to spend our special night with our friends, family and those who have supported us along the way. Thanks to the AWESOME Calm Doon Ceilidh Band for keeping us dancing all night, and to The Grassmarket Community Project for hosting us. During our First Birthday Party last weekend we held a charity raffle in aid of The Cookie Jar Foundation and the Edinburgh MS Therapy Centre. Both charities are very close to our hearts for many reasons, and with Maclay, Murray and Spence LLP charitable trust DOUBLING all donations we are delighted to announce that we raised a massive £500! We obviously could not have managed ourselves, we were supported by some wonderful local organisations who very generously donated prizes. The Carlton Hotel The spectacular Carlton Hotel who very generously donated a champagne afternoon tea! Brodies 1867 A beautiful hamper full of delicious goodies, including their fabulous teas, coffee, hand made choccies and cakes! Eteaket The lovely people at Eteaket donated a One Cup Starter Kit – a perfect introduction to their glorious teas! The Scotch Whisky Experience Who donated a voucher for a family tour of their 5 star attraction and to have a wee dram. And not forgetting Sainsbury’s West Port who donated some very scrummy boxes of chocolates. No wonder we raised so much money – these were amazing prizes, we are so grateful to everyone who helped this wonderful cause!! Thank you to Mamma’s Pizza for bringing us their delicious pizza to keep us dancing, it was sooooo good (as always!). 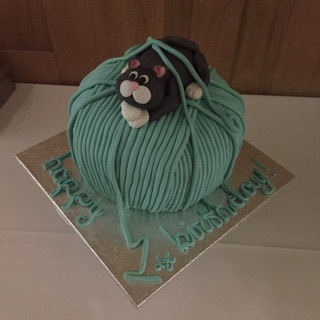 And final thanks must go to Rosanna at Grace & Co Bakery for what was possibly the most amazing Cat Cake we’ve ever seen! !